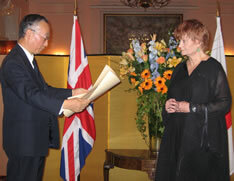 On 19 May 2004, the Order of the Rising Sun, Gold Rays and Rosette was presented to Ms Thelma Holt CBE in recognition of her efforts to foster cultural exchange between Japan and the UK through theatre exchange. The decoration was bestowed upon her by Ambassador Masaki Orita at a reception held at the Embassy. Thelma Holt has been actively involved in the promotion of Yukio Ninagawa's unique adaptations of the works of Shakespeare ever since being inspired by his work in the mid-1980s. As a result of her enthusiasm and devotion, Ninagawa's productions of Shakespeare's plays performed by Japanese actors have been widely introduced to, and appreciated by, British audiences. In addition, Holt has successfully introduced high-quality Japanese performances such as Hamlet by the famous Japanese Kyogen actor Nomura Mansai to this country, further strengthen ing the valuable contribution she has made to the promotion of cultural exchange between Japan and the UK. She has also played an important role in the promotion of British theatre in Japan, in particular in her role as Patron of the Oxford University Dramatic Society (OUDS), through which she has instigated and co-ordinated several successful OUDS tours in Japan. We are here today for the very pleasant purpose of honouring Ms Thelma Holt by bestowing upon her the Order of the Rising Sun, Gold Rays and Rosette for her lifelong contribution to the promotion of cultural exchange between Japan and the United Kingdom. A graduate of the Royal College of Dramatic Art, after spending some time as an actress Ms Holt turned to work as a producer. No doubt most of you are aware of Ms Holt ' s numerous achievements throughout her distinguished career at the Round House and the Royal National Theatre and with her own production company, as well as through her advisory role at the Arts Council. It would take too long for me to describe everything she has accomplished, so I will focus only on those activities which have some bearing on Japan, as that is what we are here to celebrate this evening. Thelma Holt is much admired for her passionate enthusiasm and love of the theatre in the UK and in Japan. In particular, she has been actively involved in the promotion of Yukio Ninagawa's unique interpretations of the plays of Shakespeare ever since she encountered his work in the mid-1980s. She was especially inspired by his productions of Macbeth in 1985 and Medea in 1986. Following consultations with the Japanese producer Tadao Nakane of the Toho Company, who had previously produced Ninagawa's work, she brought Macbeth and then Medea to the Royal National Theatre in 1987. As a result of her enthusiasm and devotion, Ninagawa's productions of Shakespeare's plays performed by Japanese actors have been widely acclaimed by British audiences and critics alike, demonstrating that theatre, and indeed Shakespeare, can work beyond language and cultural barriers. Since 1987, Ms Holt has presented Ninagawa's work a total of thirteen times. These productions include Hamlet, The Tempest, A Midsummer Night's Dream and Pericles. After British audiences had responded favourably to Ninagawa's interpretations of Shakespeare plays and Greek tragedies, Ms Holt went on to challenge them with modern Japanese plays, such as Matsuyo Akimoto's Suicide for Love and Shuji Terayama's Shintokumaru. These, too, were received with eager anticipation by the British public. Ms Holt's other triumphs include her involvement with Tango at the End of Winter by Kunio Shimizu and Peer Gynt by Ibsen. The latter was performed at a commemorative event at the Lillehammer Winter Olympic Games, starring Japanese, British and Norwegian actors, and received international acclaim. Ms Holt has managed to attract a number of British actors who are household names for Ninagawa's English language productions. For instance, Alan Rickman starred in Tango at the End of Winter. Another example is Ninagawa's third production of King Lear, which featured the late Sir Nigel Hawthorne and was produced in co-operation with the Royal Shakespeare Company. Clearly, Ms Holt is closely associated in the public mind with the tremendous success of Ninagawa's productions in the UK. In fact, it was Miss Holt's efforts in bringing Ninagawa's work to the theatre-going British public that led to the revered Japanese director receiving a CBE from the British government in 2002 for his outstanding interpretation of the works of Shakespeare. Ms Holt's contribution to Japan-UK theatrical exchange goes beyond her association with Ninagawa. For instance, she has recently - and with great success - introduced to British audiences a high-quality Japan-UK collaborative production of Hamlet, starring the famous Japanese Kyogen actor Nomura Mansai and directed by Jonathan Kent. 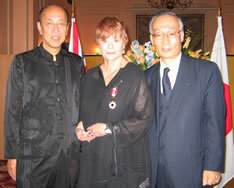 She has also played an important role in the promotion of British theatre in Japan. In particular, as a member of the Shakespeare committee at the Saitama Art Theatre, set helped to plan the on-going project to perform all thirty-seven of Shakespeare's plays. Having served as a representative of the UK, she advised her Japanese counterpart and worked as the co-ordinator between the RSC and Japan, which helped to ensure the success in Japan of Shakespeare plays such as King Lear . Finally, as patron of the Oxford University Dramatic Society (OUDS), Ms Holt has applied her unique experience and expertise in the field of performing arts to ensure that the Society's productions could be savoured by Japanese audiences. To this end, she has organised a number of successful OUDS tours to Japan, which have included performances of Winter Story and As You Like It . As regards Oxford, I am especially happy to mention that Ms Holt and I share something common. Both of us are attached to St. Catherine's College, Oxford. She is an Emeritus Fellow and I am an Honorary Fellow of the College, where I studied two years almost 40 years ago. We often meet with each other at gatherings of the College and my wife and I always enjoy meeting with her. Master of the College, Mr. Roger Ainsworth and other St. Catherine's people have been extremely delighted to know today's occasion. The decoration which Ms Holt is about to receive is awarded to foreign nationals who have made a longstanding and notable contribution to bilateral relations, for instance through activities which promote cultural exchange and mutual understanding between our two peoples to a significant extent. As I trust I have made clear, Ms Holt has indeed made such a contribution and fully deserves to be honoured this evening. That is why it gives me great pleasure to bestow upon her, on behalf of His Majesty The Emperor of Japan, the Order of the Rising Sun, Gold Rays and Rosette. You, your Excellency, are the only man in the world who is in a position to confirm that when I was first told of this wonderfully generous gesture on the part of Japan, I was briefly at a loss for words. Antony Sher, who is with us tonight, when told of this phenomenon, laughed so much in disbelief that he almost missed his entrance as Iago when we were recently in Japan with the RSC's Othello. Well, Tony, here is the living proof. To be honoured by one's country is thrilling and heart-warming, but to be honoured by a country that is not the land of your birth, but has become your spiritual home, adds an extra dimension. I receive this honour humbly, and I can assure you I will wear it with the greatest of pride and continue to serve you to the best of my ability. May I also thank you for your generosity in inviting here so many of the friends who have shared the journey that Ninagawa and I have been on - the National Theatre, the Royal Shakespeare Company, and perhaps most importantly now the Cameron Mackintosh Foundation, who have enabled us to take young ambassadors from Oxford University on an annual visit with a Shakespeare production to Japan, thus ensuring our insurance policy for tomorrow. Ninagawa and I could never have achieved any of the things we have done together without all of you being willing to give of yourselves beyond the call of duty. You have shared and continue to share our dream, and I thank you.